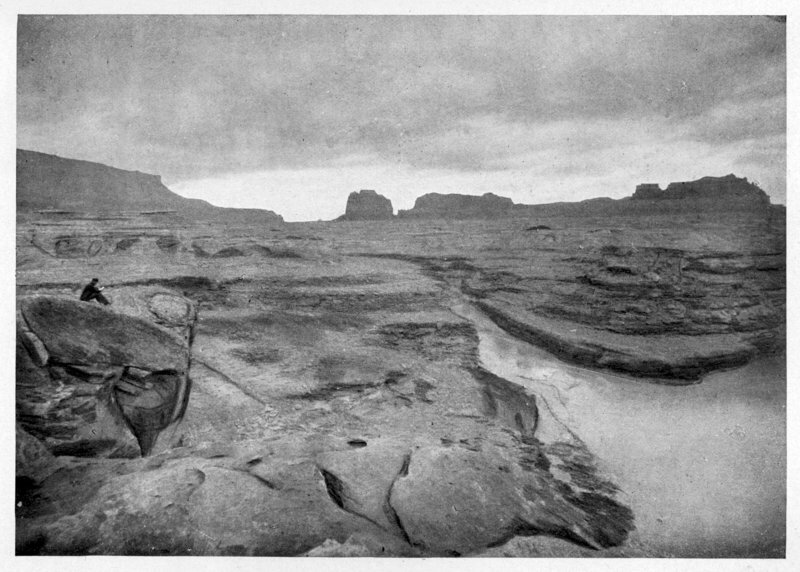 Once more we find ourselves in Utah, this time around 1877 by Dirty Devil River (ZGWS). exclaims the Milwaukee Journal as it introduces the coming daily serial starting May 7, 1931. She had a wonderful step, a free, swinging, graceful stride, expressive of health and vitality. She did not look slender, as in the long ulster, but superb, broad of shoulder. She wore a half-length coat over her brown dress. It had a collar of dark fur which presented vivid contrast to her exquisite complexion. The veil was tucked back and now permitted sight of a wave of shining golden hair. At a little distance her eyes looked like great, dark holes set in white. But as she approached Jim saw they were violet in hue, warm, beautiful, fearless. He was a young man in years, but he had the hard face and eagle eye of one matured in experience of that wild country. He bestrode a superb bay horse, dusty and travel-worn and a little lame. The rider was no light burden, judging from his height and wide shoulders; moreover, the saddle carried a canteen, a rifle, and a pack. From time to time he looked back over his shoulder at the magnificent, long cliff wall, which resembled a row of colossal books with leaves partly open. It was the steady, watchful gaze of a man who had left events behind him. When Herrick thinks to save his cattle from rustling by setting two gangs up against each other he might not have been thinking all that clearly. Hays and Heeseman are more trouble than help. Fortunately for Herrick Jim Wall turns out to be on his side. Wall goes against his boss, Hays, when Hays kidnaps Helen – Herrick’s sister. That seems to be the line across which Wall was not willing to cross.